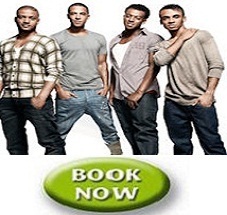 JLS - Tue Dec 7 2010 - 7:30 PM LG Arena, The NEC Excellent » Buy Now! JLS - Tue Dec 21 2010 - 7:30 PM LG Arena, The NEC Excellent » Buy Now! After their debut single ‘Beat Again’ reached number one, JLS have announced their first ever headline tour of the UK in February next year. The boys will be calling at the LG Arena at The NEC on Friday 5 February 2010. Maximum of 4 tickets per person. JLS: Oritsé, JB, Aston, and Marvin are the most successful group of all time to enter The X Factor; the most popular show on British TV. From the outset it was clear that JLS were not usual X Factor fodder. They took their X Factor path one step at a time, from auditions to boot camp to the judges’ houses right up to the live show knock-out rounds and eventually the final. It became similarly clear to everyone around JLS that they weren’t in this for the short haul.